Chicago is home to some of the United States' most important architecture. There was even an architectural movement founded by William Le Baron Jenney called the Chicago School, which resulted in many of Chicago's most recognizable structures. Taking an architectural walking tour of Chicago is a great way to experience the city and discover the little details that make it great. A good tour to start with is a look at some of the buildings in the downtown Loop neighborhood. 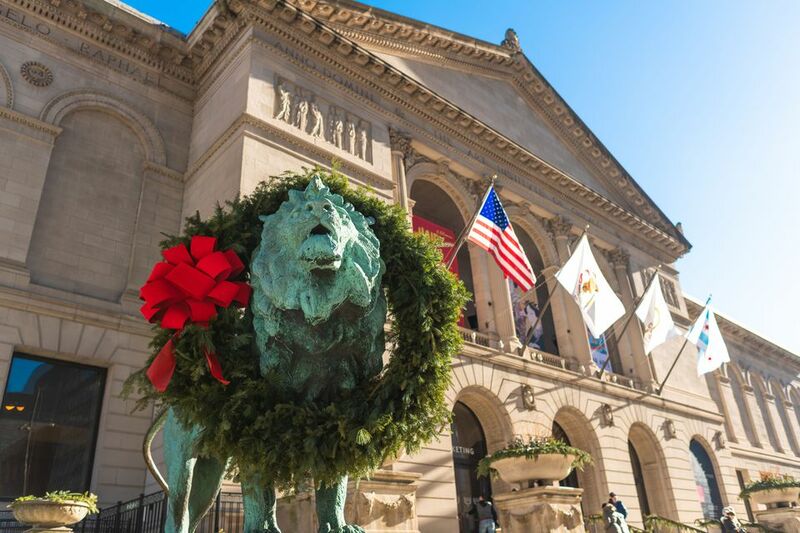 First stop is at Chicago's revered Art Institute of Chicago (111 S. Michigan Ave.). In 1891, architects John Root and Daniel Burnham were given responsibility to oversee construction along Chicago's lakefront for the World's Columbian Exposition in 1893. Root envisioned a more modern design for the fair, keeping in line with the rising Chicago School, but Root suddenly died from pneumonia before construction began. Burnham and others changed Root's designs to a Neoclassical Beaux-Arts design, which is very prominent at the Art Institute. The building is symmetrical, with plenty of arches, bas-relief panels and columns typical of the style. If you look along the top of the building, the names of many prominent artists are carved into the stone--a bit of wishful thinking on the designers' part--as almost none of the artists have had works displayed at the museum. On the north side is the Modern Wing, and its design by architect Renzo Piano stands in stark contrast to the main building. Check this out: The museum's famed bronze lions flanking its entry staircase appear to be identical at first glance, but they're really not. The lion on the south end "stands in an attitude of defiance" and the north end lion is "on the prowl." Special thanks to Margaret Hicks from the Chicago Architecture Foundation for her guidance during this project. Follow Michigan Avenue one street south to Jackson, cross to the south side of the street, turn right and head down to Plymouth Court. Look to your left and you'll see the Harold Washington Library (400 S. State St.) rising above the train tracks. Opened in 1991 and at the time the largest public library building in the world, the 10-story structure was named after Chicago's late Mayor Harold Washington, who helped initiate the ground breaking, but died before the building was completed. While the Harold Washington Library looks like an architectural mess, the hodgepodge style is actually an homage to Chicago; the design wouldn't fit anywhere else in the country. The brick front with its soaring arched windows and friezes is a reflection of the copious Beaux Arts style around the city, and if you walk around the building you'll notice the brick is just a facade. The sides are modern looking steel and glass, a nod to Mies van der Rohe. The ornamentation on the building includes the face of Ceres--the Roman goddess of growing plants--as well as corn and seed pods, symbolizing the Midwest's rich farming history. Head back down Jackson a short ways west to Dearborn Street and you'll find yourself in front of the Monadnock Building (53 W. Jackson Blvd.). At 197 feet tall and constructed in 1893, it's largely recognized as the world's first skyscraper. Even if some might find that debatable, what is a fact is that it's the tallest building fully supported by masonry walls unlike the steel supports used today. The walls at the bottom of the building are 6 feet thick in order to handle the building's massive weight. The outer walls then curve in a bit and go straight up before curving back out at the top. That curve, plus slight bay windows, are the only ornamentation of note on the building. Directly across the street from the Monadnock is the Kluczynski Federal Building (230 S. Dearborn St.), designed by famed architect Mies van der Rohe. His "less is more" Bauhaus style is on full display here. The two tall buildings making up the center are big, black hulks of glass and steel. Unlike other plazas in the city that have fountains, grass and places to sit, the plaza at the Federal Center is cold, uninviting and the minimal seating it does have is a couple slabs of marble and combined with the one-story post office, everything feels very utilitarian. But that doesn't mean van der Rohe didn't have an eye for detail. The all-glass lobby was very deliberate, to tie in the granite tiles of the plaza to the granite walls in the lobby. Black i-beams that run up the side of the building, while looking very industrial, are completely ornamental. Check this out: As a testament to van der Rohe's dedication to detail, stand in the plaza and face the building. With your eye, follow any line between the granite tiles and you'll see they match up perfectly with the i-beams to create a continuous line from the ground all the way up the building. Walk a couple blocks north on Dearborn to Monroe, and on the northeast corner is the landmark Inland Steel Building (30 W. Monroe St.). Built in 1957, this structure is hailed as Chicago's entry into modern architecture after World War II. It also has the distinction of being the first skyscraper to be built in Chicago after the Great Depression some 20 plus years earlier. Appropriate given that it was built as the headquarters for a steel company, the outside has distinct brushed steel cladding. The building itself is made up of two different parts -- the tower closest to Dearborn houses office space, while the tower to the east contains all elevators and utilities. This design allowed the office building to be supported only by exterior columns, allowing the office space to be completely open to accommodate any floor plan desired by the tenant. Check this out: The thin horizontal steel strip that splits the lower third of the window isn't just decorative -- it was put in place to help ease the jarring effect of a solid floor-to-ceiling pane of glass that gave one a feeling they could fall out. "Form follows function" triumphs again. Walk east on Monroe to State Street, and you'll find the Carson Pirie Scott Building, designed by architect Louis Sullivan. Built in 1899 and sold to Carson Pirie Scott in 1904, it served as a major retail destination until Carson's closed in 2007. The building is a steel structure, allowing for wide, horizontal windows providing natural light and handy spots to showcase merchandise. ​Its beautiful rounded tower at the building's corner entrance features cast iron ornamentation that draws in the pedestrian's eye from both State and Madison Street -- another example of "form follows function." Check this out: After Carson's closed and moved out, the building owners renamed it the Sullivan Center. Given that it was the "Carson's Building" for more than 100 years, the new name will likely take a generation or two to catch on. Across the street from the Carson's Building on the sorthwest corner of State and Washington is the Reliance Building (1 W. Washington St.), a National Historic Landmark. Designed by Charles Atwood, an architect at Daniel Burnham's firm, it's known as the first skyscraper to be built with glass as the main part of its facade, which of course is common practice today. Completed in 1895, it's an early example of the "Chicago School" of design. The building currently houses the Hotel Burnham and Atwood, obvious nods to the Reliance's architectural history. Back across to the east side of State Street, the Marshall Field's Building with its famous corner clocks and holiday windows is the second largest retail store building in the world. A National Historic Landmark, the original part of the building was built in 1879 and subsequently added onto to become the mammoth building it is today, filling an entire city block. It was home to the Marshall Field and Company flagship store from the beginning until 2006 when the chain was absorbed in a merger with Federated Department Stores and became Macy's flagship Chicago store, a move still protested by Chicago residents to this day. In deference to the building's history, Federated left the "Marshall Field and Company" nameplates that are attached to the side of the building. Check this out: Be sure to stop into the five-story atrium at the southwest corner of the building, which features a Tiffany glass mosaic ceiling. Head east on Madison to Millennium Park, and you'll find the Aon Center (formerly the Amoco Building, and the Standard Oil Building before that) rising up behind it. Completed in 1973, the Aon Center is Chicago's third tallest building in Chicago. It was bumped out of its second-place spot behind the Willis Tower in 2008 after Trump Tower was built. The construction process used to build the Aon Center was the same as the World Trade Center towers in New York City, and it has the same plain square shape. The sides of the building were originally clad in Italian Carrara marble, but designers used slabs that were too thin which proved to be an incredibly costly mistake -- after years of stopgap measures, the owners of the building had to finally reface the entire building with granite instead to the tune of $80 million. Head south down Michigan Avenue and you'll see the Cliff Dwellers Club, formerly known as the Historic Michigan Boulevard District. Extending from Randolph Street south to 11th Street, it's easy to see how it received its moniker. The buildings seamlessly blend together despite their architectural style differences, all with the same setback from the street, and it provides for a gorgeous urban streetscape. Head down one block and you'll be back to where our tour started, the Art Institute of Chicago.